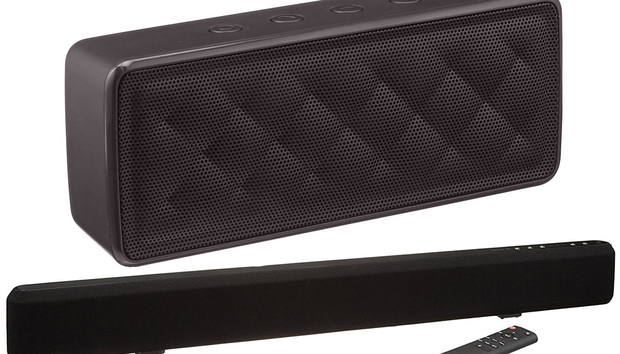 First up is a portable wireless Bluetooth speaker for $20, a savings of 20 percent. But Prime members save an additional $5.20, bringing the price down to an all-time low of $14.58. With a wireless range of up to 33 feet, this speaker will let you connect your device from anywhere in the room, but if your device is not Bluetooth-enabled, the speaker comes with a 3.5mm aux in jack. It also features up to eight hours of battery life on a single charge. If you're looking to amp your TV's sound, the AmazonBasics 2.1 Channel Sound Bar with Built-In Subwoofer, is $63.31 for Prime members or $80 for non-members. Made for home entertainment systems, this sound bar can be adjusted to three different modes and features full range stereo speakers. It also connects to your TV wirelessly though you'll still need to connect it via optical or RCA audio cable (both cables are included in the box). And one more deal that jumped out at us is a 13.3-inch laptop sleeve in black for $8.35 ($10 for non-Prime members). Padded for optimal protection, it has a zippered top to easily slide your laptop in and out, and is perfect for a small Chromebook or MacBook Air. It's slim and form-fitting as well for easy transport. There are several other AmazonBasics on sale now with more being added as Prime Day approaches, so if you're looking to snag a deal on no-frills electronics, it's worth taking a look.